Building a national charitable event from scratch isn't easy. Yet that's what UK-based organization Comic Relief has in mind with Red Nose Day, which is supported by NBC, Walgreens, and M&M's. 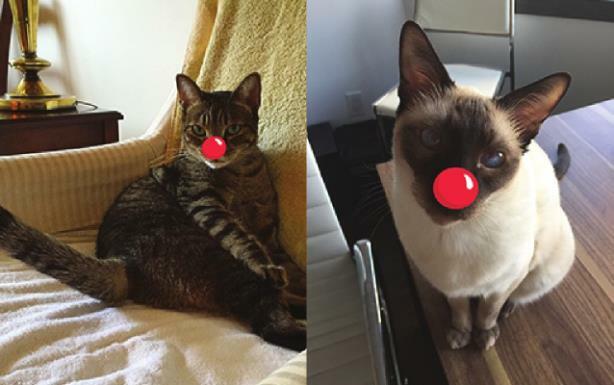 Red Nose Day supporters Sebastian and Roscoe. (Image made via the Red Nose Day app). The coming-out party for fundraising extravaganza Red Nose Day is set to climax Thursday night with a three-hour, celebrity-filled telecast on NBC. Yet British charity Comic Relief, which brought the event aiding child-poverty causes to the US, has even greater ambitions: making it a CSR spectacular embraced by more household-name brands, much like it is in the UK. In Great Britain, where the event launched in 1998, the occasion has 90% public awareness and is supported by activities in two-thirds of schools and more than 50 corporate sponsors, says Amanda Horton-Mastin, innovation director at Comic Relief. She has worked with the group in the UK since 1994. To date, Red Nose Day, which takes place every other year, has raised more than $1 billion for charities dedicated to helping children and young people in poverty in the UK and Africa. Now the campaign manager for the US, Horton-Mastin says her goal is to grow the Red Nose Day brand stateside. "Our ambition is that once people have seen the show and know what it is about that we will get a lot more brands and organizations involved in the US," she says. NBC is supporting the telecast – A-list talent such as Jimmy Fallon, Zak Efron, and Coldplay, which penned a Game of Thrones-like musical number, will appear – with a heavy digital component, says Rob Hayes, EVP of digital at NBC Entertainment. "We built an app where you can take a photo and ‘red nose’ yourself whether on Instagram, Facebook, or Twitter," he explains. "We really started to see that take off in the last 24 hours." In addition to NBC, Comic Relief partnered with Walgreens, the event’s exclusive retailer, and M&M’s to bring the fundraiser across the pond. Mailee Garcia, senior manager of PR at Walgreens, said the drug-store chain has raised $7 million through in-store sales of red noses, which cost $1 each with half going to the charity and the other 50 cents to produce the nose, surpassing its $5 million target. Weber Shandwick handled PR and social media in an integrated campaign for Walgreens that included digital marketing, mass media, and in-store signage. The firm also created a video for the event, called First Nose Sold, which has been viewed more than 15,000 times. The retailer’s success in supporting Red Nose Day will be measured based on the video’s "social engagement and general media relations coverage and impressions," Garcia said. M&M’s came on-board in no small part because corporate parent Mars has supported Red Nose Day in the UK since 2011, says Lee Andrews, VP of corporate affairs at Mars Chocolate North America. "Our Maltesers brand in the UK has helped raise more than £3.5 million for the cause, so we already believed in [its] power," he says. "But obviously, we, nor Comic Relief, had no illusions that we could simply transfer the 25 years of equity they’ve built in the UK to the US market." To raise awareness and funds, M&M’s relied on a Twitter campaign that prompted people to make someone else laugh and share that moment with the hashtag #MakeMLaugh. The effort kicked off with an event at its World store in New York on May 11 with Saturday Night Live star Jay Pharoah. "We can’t overstate the role of social – not just in raising awareness, but also in spurring our fans to join M&M’s in raising money," says Andrews, noting the brand is on-pace to donate $1 million, with $250,000 of that generated from consumers engaging with the hashtag. Weber Shandwick also led PR and social media for M&M’s, in partnership with Davie Brown Entertainment, which manages the brand’s entertainment work. Horton-Mastin explains that it was critically important to have big brands such as Walgreen’s and M&M’s driving comms for the event. "One of the things we learned in the UK is that the success is all about creating the right partnerships...Like any charity, we have tiny budgets, and so we have to work with partners to get the awareness out there," she says. "That was especially true in the US where we had almost no awareness." She adds the group will conduct research to find out how much awareness has risen following the broadcast. It was important that the corporate partners be the face of the campaign for another reason, Horton-Mastin says. "We didn’t want to create consumer confusion" with Comic Relief USA, a former charity dedicated to helping America’s homeless, she says. In the 1980s and 90s, Comic Relief USA staged telethons on HBO hosted by comedians such as Billy Crystal, Robin Williams, and Whoopi Goldberg. The UK charity bought the rights to the name in the US from Comic Relief USA, which no longer exists. "The two companies were created almost at the same time, but were not one in the same," says Horton-Mastin. "That is why we’re not promoting [our name] Comic Relief at all, because that would lead to a lot of consumer confusion." Sunshine Sachs is Comic Relief’s lead PR agency for Red Nose Day in the US. The organization also works on communications with charities that support children in poverty, such as Boys & Girls Clubs of America, Feeding America, National Urban League, and United Way, all of which have benefitted from funds raised. Will more brands get on-board? Agency experts specializing in CSR say there are many good causes that brands can attach their charitable efforts to, adding that the jury is still out on the opportunity for new brand partners. Ron Loch, principal and MD for sustainability consulting at G&S Business Communications, says public awareness about Red Nose Day is undoubtedly much higher than it was even a month ago. However, he says brands may be reticent about getting involved with it because the event has become so closely tied to its launch partners. "I think in the US, it is going to be a little more difficult to add other brands because it has this association with Walgreens that is so strong," says Loch. "So I wonder how many more major brands might decide to jump in and make this part of their cause marketing program." He advises interested brands to measure consumer awareness as it relates to Red Nose Day and child poverty. "A lot of people have bought red noses but the question is, ‘Did they get more involved than that?’" he asks. "Are people just having fun participating, or is it actually furthering their understanding of childhood poverty? I don’t know the answer, but I think that’s an important question to ask." Kelly Fisher, who joined Ogilvy Public Relations as VP of CSR last December from Toyota, where for six years she led CSR, philanthropy, and communications, applauds the launch strategy. "I think they’ve made very smart and strategic partner choices," she says, adding that for new brands that come on-board, such a platform leveraging celebrity, humor, and entertainment is a good one. "People are very busy and have a lot of concerns in their lives, and they’re often confused by messages that companies use to talk about their CSR programs," Fisher notes. "Something like this could really help brands break through that noise and confusion." Yet would-be sponsors also need to do their due diligence on the allocation of donations and ensure it is communicated as transparently as possible. "I always try to find a balance between the marketing of the cause and the actual impact of the funding and the work of the partners," says Fisher. "If those two things are in balance, then other partners should certainly consider becoming involved."